Seabuckthorn (Hippophae Rhammonides) is a hardy, deciduous shrub bearing small yellow to orange-red berries. This plant has been used for centuries in the traditional medicinal system of Asia and Europe mainly for its nutritional and medicinal value. It possesses an exclusive composition of vitamins, nutrients and essential fatty acids usually found only separately in different plants and sources. Seabuckthorn grows widely in Europe, central Asia and temperate regions of South Asia, India and China, ranging in altitude of a minimum of 60 m asl to a maximum of 5200 m asl. The Spiti valley has a fairly large concentration of Seabuckthorn, particularly along the river bed covering an area of more than 200 hectares, as per official figures. The 3 varieties of Seabuckthorn found in Spiti are rich in carotenoids, xanthophylls, phenolics and flavonoids and have a higher content of essential oils. Seabuckthorn was used in China for over 12 centuries where it was first used for traditional Chinese medicine strengthening stomach, blood circulation and respiration. 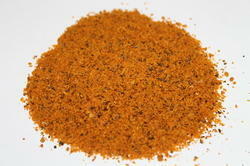 Seabuckthorn is currently used in juice, sports drinks, jellies, ice cream, cosmetics and medicines. Seabuckthon is rich in macronutrients and micronutrients. Seabuckthorn contains vitamins B1, B2, folic acid, C, E, beta-carotene (provitamin A), and K. It contains carotenoids, flavonoids, phenols, terpenes and at least 20 mineral cofactors. Seabuckthorn also naturally contains 5-HT (serotonin), a neurotransmitter that helps regulate emotions. Seabuckthorn numerous health benefits include cardiovascular, immunity, anticancer, memory, growth, anti-inflammatory, and skin health. Seabuckthorn contains more than 60 antioxidants and high ORAC value. The unique and high nutritive combination of Seabuckthorn, gives it the ability to have antioxidant, anti-cancer, anti-ageing, anti- fungal, anti-inflammatory, anti-radiation (protects white blood cells), anti-constipation, cardio tonic, stomachic, derma tropic properties. It is also credited with the ability to maintain healthy cholesterol levels, soften blood vessels, reduce blood fat, and promote circulation and natural healing. Seabuckthorn is known to enhance the immune system by eliminating the mutant and dead cells caused by free radicals thus killing cancerous cells. 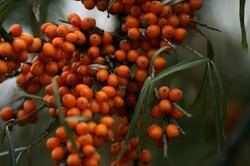 Seabuckthorn can safely be regarded as a perfect dietary supplement. Looking for Seabuckthorn Products ?